We now want to elaborate a bit on what we have discovered in Joshua 1:7, the importance of meditation. We want to show a way a person can actually meditate. This exercise is very exciting because it produces immediate fruit. We will look at what I call “OXPET” to help us go through some principles for meditating. Many of us are great at analysis but poor on application. Meditation blends the two together. We want to look at a way we can overcome some of these hindrances that hold us back from getting close to the scriptures but not benefiting from them. We want the scriptures to come alive! Maybe before I go on, I can give you a general example of meditation. I was just reading a passage for my meditation time from John 4. I was going to read further on, and in fact did scan ahead a bit, but the Lord was already starting to speak to me from verse 1-3. So I just accepted that my study would be limited to those few verses. “When therefore the Lord knew that the Pharisees had heard that Jesus was making and baptizing more disciples than John (although Jesus Himself was not baptizing, but His disciples were), He left Judea, and departed again into Galilee” (John 4:1-3). We know the greater context about how, right after this, Jesus had to go through Samaria. It was there He met the Samaritan woman and many came to know the Lord. These three verses can be easily overlooked in light of the exciting things that happened later on. But the Spirit started prompting my heart that there was a message here for me. I decided to ignore the later verses (this is a conscious decision to trust the Spirit’s leading even in studying God’s Word). Meditation requires a discipline to usually focus on a small passage like this. But I, like others, asked, “What does the Lord want to say through these verses?” But I believe He can use any passage to teach me so I humbled myself and began to talk to Him about these verses (in quiet prayers). “Lord, what are you trying to teach me here?” I continued on in a little analysis of what was happening in the verses. This might differ for different times and people, but this is what the Lord was helping me to see that day. Analysis: Once Jesus heard about the Pharisees hearing about Him baptizing more people than John the Baptist, He made a decision to leave the area. Principle: Sometimes when a person is having great success, God might call them away from there to another place and even another ministry. Principle: It seemed the Pharisees were getting jealous. They noticed such things. Jesus allowed this to shape His own plans. He could have stayed there and had His disciples baptize more people. This would have been natural. But He was sensitive to the Lord’s timing. Application: God might take me one day out of a good and successful ministry. If He does, then I must follow the Spirit’s leading. Bruce Wilkerson did this. Jesus did it. I must be willing to not let success rule but God’s Spirit lead. I did not sense that there was any particular ministry that the Lord wanted me to avoid right then, but it seems that He is preparing me for this future possibility. I analyzed the areas that I was successful in right now or could be in the future, by God’s grace. I tell Him that I will pursue the Father’s will rather than building upon success. I must not live by success. I must live by a higher principle to get God’s work done. Success is not the same as direction. You can see that this short meditation touched my soul. It touched a sensitive part of me. I recognize that He might be readying me to avoid following success. His lessons are not always immediately applied, but they all have to do with readying me for His work. Perhaps He does this ahead of time to keep me from temptation that I would otherwise not discern. Meditation is the means for true success because it enables us to constantly live as Christ’s disciple through the Spirit. 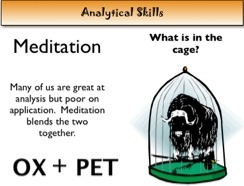 Now let us look more at how we can meditate on a passage using the OXPET method. The OXPET comes from two words, OX and PET. It highlights five ways we can meditate, one way for each letter. We are not saying you need to use this method to meditate. Instead, we are trying to get the feel of meditation. It is like learning to ride a bike. Someone is running behind you, helping you hold up the bike. And as you pedal, you feel rather free. Then you realize the person that was holding you is far behind you and is no longer is holding on! We are introducing ideas to get you started. The rest is up to you to practice until it becomes part of your own daily devotional time. These methods will hopefully become integrated into your own skill set. Feel free to forget the ox which is being treated as a pet (in a cage). The neat thing about meditating is that it will help you in all your ministries using God’s Word, whether as a Sunday School teacher, teacher, evangelist or preacher. Commentaries become only helpful when trying to make sure that you are not far off with some interpretation of a passage. Again, what is the problem that many of us face? We are too analytical. We need to learn how to take what we observe and meaningfully apply it to our lives. Someone has said it well. The head and the heart are only a foot apart, but they act as if miles apart. So what is the OXPET? Let me introduce you to the OXPET chart. 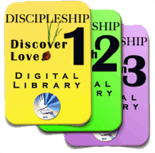 Each letter stands for a significant way to think about the scriptures. It is a tool that helps us combine analysis with application. I came up with this when I tried to think how I meditated on the scriptures. I basically took a passage that I just was joyfully meditating on and identified these different processes. Are there more? Probably. As I said, this is only to get you started. I want to introduce each item to you first. Then, we will work on an example together. After that you will have some opportunities to practice it. We will keep Matthew 6:33 in mind and use it to provide illustrations. “But seek first His kingdom and His righteousness; and all these things shall be added to you” (Matthew 6:33). Think of the opposite sense to a word, command, illustration, etc. that one is meditating on. These contrasts easily stir up the mind. Light<>dark; thirsty<>full; happy<>sad; late<>early. In the above verse, Matthew 6:33, we see the word ‘first.’ By taking the opposite ‘last’ and inserting it into the verse, “Seek last …,” we see that how the word ‘first’ highlights the priority of what Jesus wants. We cannot allow the seeking of His kingdom to drift into second, third and definitely not last place in our lives. This one word, then, brings out more clearly Jesus’ emphasis. He could have left it out. Expand and mildly exaggerate the sense of the word or verse. The more practical and personal, the better. In this case, we might think of the word ‘seek’ from Matthew 6:33. Seek means to go out and look for. It calls for me to think that something is important enough to search for it. But how important is it to me? If it is only a bit important to me like a US$1 bill, then I will look but then give up the search after a short while. But if it is a hundred dollar bill, then I will even get friends to help me find it. Jesus is calling me to make the expanding of His kingdom very important. I am to go all out and make it a priority in my life. In application, I might take a look at my life and see what is most important to me. How do I know? How do I spend my money and time? This ‘Expand’ is perhaps the most used meditation principle. On its own, it can greatly amplify the meaning so that the truths of God’s Word grab hold of our attention. When this technique is working properly, one is humbled and awed at what one has found in God’s Word. Personalize the key meaning by placing yourself in the context and situation being described. Substitute ‘your name’ or ‘I’ for the one being used. In the above verse, it says “(You) seek.” The ‘you’ is often not written in a command (KJV “Seek ye”), but it is still there. In this case, we can reason that Jesus was talking to His disciples back then. But we need to ask if He is speaking also to me. In other words, are His words relevant to my life? Is Jesus telling me to seek first His kingdom? Sure He is. Then I respond by saying “I will seek first your kingdom.” We could also apply the last ‘you’ to our lives. The promise is for me. If I seek first …, then He will give to my life whatever is needed. This, of course, shows us that the Christian life is a life of faith. Only by carrying out what He wants through faith, will we see His special promises come true. Step out in faith and we, as well as all of His disciples, will be cared for. What a marvelous promise! Emphasize a meaning by observing repeated words and phrases and personalizing them. This method makes more sense in longer passages where we actually can see repetition being used. For example, go back to Joshua 1:6-9 and see what word or phrase is being repeated. “Be strong and courageous” is repeated three times! The Lord strongly emphasized this point. Why did He emphasize it so? It is probably because Joshua was tempted to be weak and give in. I then can think about my life. I might think both about the last time I was strong and courageous as well as the last time I was weak and gave in. I would follow through with prayer asking God to make me strong and courageous. Emphasis doesn’t always come from repetition, but it often does. Rhyme, word order, contrast, use of special initials (e.g. Psalm 119) and words that sound alike (hard to detect because we do not know the original languages) and special sentence structure (Hebrew symmetric poetry 1-3-5-3-1). Translate elusive words, phrases or verses into your own easy-to-understand words. I could say define, but the word translate is a bit broader. We, in fact, always need to remember that we are looking at translations. We should try to think what the original word means in this context. For your information, the context determines the usage (the definition) more often than not. As you see, just with a few special questions and observations, we have only just begun exploring Matthew 6:33. I personally am again humbled at the power of Jesus teaching. I am like a very poor student who understands so little. I want to learn much more from Him. Let’s look at another short verse. The psalmist is going through some difficulty. He desperately needs something and therefore cries out to God. If he was silent, then it would be as if he had no problems. I think about the gambling casinos being proposed in my area. Am I crying out or just ignoring what is being done? A desperate voice would show that I really care. If my voice is mild, then it doesn’t really disturb me. Some things should cause me to get noisy before God. What important things should I be praying about (the context of this verse is a prayer to God)? I want my prayers go to the Lord. If my prayers only go a quarter of the way, am I content? What about half way? 90% of the way? Am I content? No. I want my prayers to go right before the Lord and nothing else. If my prayers don’t reach God, then they are no good, no matter how close they actually get. I want my words and concerns to reach God. I want God to take notice and do something about the situation that I bring before Him. I also might reflect on how shallow my prayers are at times. I pray as if it doesn’t matter whether God hears my prayer. It is as if I am content just to pray. What a sham! The Psalmist is praying. He is making his prayer known to God. But it is not enough that he can do that. Or for that matter, it is not good enough that many around me are making their prayers known to God. The key for my personal life, family and ministry is whether my prayers are being lifted up and coming before God so that He will do something about them. Are my prayers going up to God? Do I care? Do I pray? Am I being content that others attend prayer meeting but not me? May it never be. I only have one life, and I need the Living God to hear my prayers and bring about His kingdom here on earth even as it is in heaven. People pray to all different gods. It regularly hear from people that it doesn’t matter who you pray to or what religion you belong to, it will all work out the same. But the psalmist prayed to Jehovah, the living God who revealed Himself to Moses. If my prayers go to different gods, then it doesn’t matter because they are not real. But they must come before You the Living God. I am accountable to You. You alone can hear my prayers. May I faithfully trust You to hear my prayers and work! Click Library to get articles, handouts and available slides.